The news of a new Goldfinger album this year was quite promising. John Feldmann has been producing some very high quality projects from the genre. From the chart topping, Grammy nominated blink-182 album 'California', the breakout album from 5 Seconds Of Summer, and the return to form album from Good Charlotte Feldmann has been putting his stamp on the music scene. So it only seems natural that he'd be back bringing all that he's learned since the last Goldfinger album to 'The Knife'. This is a different Goldfinger. The line-up now consists of Mike Herrera (MxPx) and Phil Sneed (The Story So Far) with Travis Barker (blink-182) handling drums on the album. I'll be honest, it is quite an exciting line-up, in my opinion, for the album. 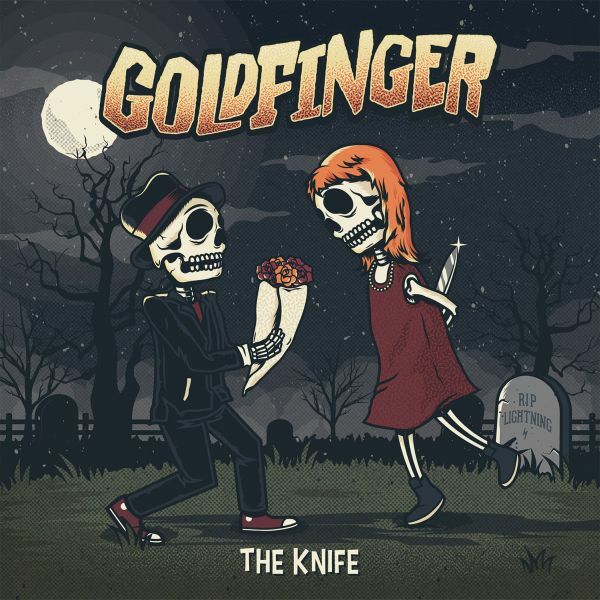 This may be a new revamped Feldmann driven Goldfinger, but that being said, this is the finest a Goldfinger album has sounded in years, maybe since their golden era. What Feldmann brings to this album is all the experience he's had since Goldfinger went on hiatus. The songwriting, production, and all around tightness of the musicians ups the quality of the songs in a great way. "See You Around" features a Mark Hoppus guest spot and is a fantastic pop/punk song. Hoppus and Feldmann play off each other well vocally and the song is one of the better summer pop/punk songs I've heard this year. "Put the Knife Away" sounds like an obvious hold over from the blink-182 'California' writing sessions. I like the song a lot. Mainly because I really liked 'California', but there is no doubt in my mind that it was either written for that or was heavily inspired by it. However don't worry too much about this sounding like 'California'. That song is basically the only one of its kind on the album. This definitely sounds and feels like Goldfinger. Songs like "Get What I Needed" and "Tijuana Sunrise" offer those great ska/reggae/punk moments I really enjoy about those classic Goldfinger albums. The choruses soar on a lot of these songs and it is just a fun well written summer album. It's also fun to hear Barker's drumming on the album. He does some very nice and interesting work over some of the ska/reggae songs that kind of hearkens back to his old Aquabats days. The bass on the album sounds fantastic as well. I'm pretty sure I hear Herrera popping up on back-up vocals here and there, especially on the track 'Orthodontist Girl', and I think that's awesome. He's a very good vocalist. It's great to hear him on a project like this. Honestly I think this might be one of my favorite Goldfinger albums. It would rank high on my list if I had to rank their albums. Feldmann brings some of his best, most realized songs on this album. I think some of his vocal work is the best he's ever sounded. The album is executed extremely well in all areas including songwriting, production, and mixing. I really like this one and I am pretty impressed that it turned out so well. This album is solid. I would highly recommend it.